Tracking progress by Concentrating PhotoVoltaic (CPV) companies SolFocus, Concentrix Solar, and Isofotón. 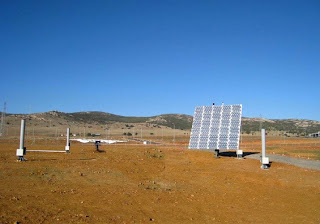 On January 15, 2008, with SolFocus First to Install Solar Array for 3 MW Spanish CPV Project, SolFocus, Inc. and ISFOC, Instituto de Sistemas Fotovoltaicos de Concentración S.A. or Institute of Concentration Photovoltaics Systems, announced the completion of the first CPV solar array for the 3MW (MegaWatt) ISFOC project. For background on ISFOC, please see ISFOC 1.3MW CPV Power Plant tenders made public. SolFocus broke ground at the ISFOC Puertollano site in October of last year with the civil construction and underground electrical work. The SolFocus array that is installed is rated at 6.2kW and has performed over its design output, which is significant at the early stage of this project. As of last Monday, Concentrix Solar’s CPV solar array installation at ISFOC in Puertollano was also moving forward, and Concentrix had completed 12 trackers with 5.75kW each for the project as shown in the above photo. These look similar to the main tracking solar arrays in Concentrix Solar Concentrator Proving Ground Slideshow. Concentrix Solar GmbH was awarded the 28th “Innovation Award of the German Economy” in the category of “Start-Up Companies”, distinguishing it as the company with the most promising innovation. I also contacted Isofotón S.A., a subsidiary of the private Grupo Bergé, for an update on their installations in Puertollano. While Isofotón understood my request, they chose not to reply. Here is the last official news from Isofotón about the ISFOC project: Isofoton, first international company to pass tests required by the ISFOC, within the frameworks of the Standard EIC62108 certification for photovoltaic concentration modules (Español). I think an EMCORE MOU with a brand new photovoltaic project developer deserves further scrutiny. No financial terms or Power Purchase Agreements (PPAs) were disclosed in the press release. At least the Southwestern United States has significant direct solar resources for CPV.